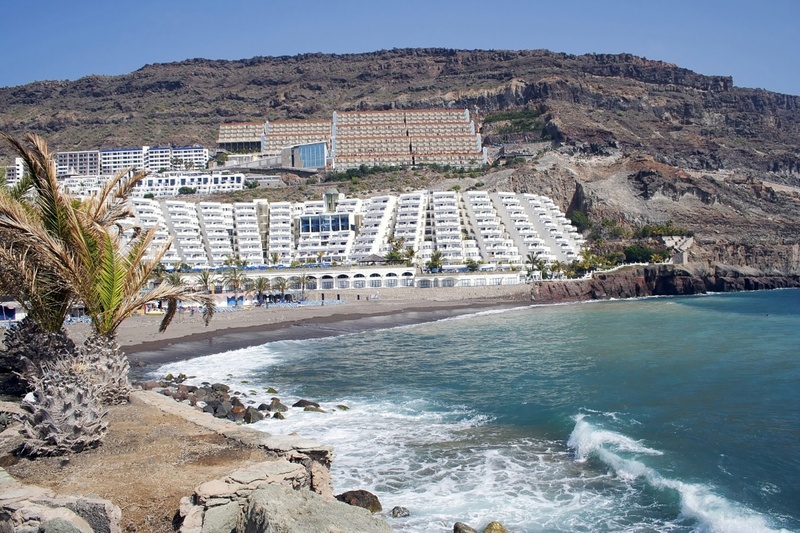 Playa Taurito is located between Puerto de Mogan and Puerto Rico in the south of Gran Canaria. It covers an area of approximately 190 meters length and 72 meters width. If you are looking for a place where relaxation is guaranteed, this spot on the island is a perfect pick. As it is located in the south, the weather is almost always dry and warm with spring temperatures throughout summer and winter. It almost never rains, but as in the rest of the island, the Calima phenomenon affects this place from time to time. This is an airborne dust coming from the Sahara Desert, making temperatures rise slightly. The beach has soft black sand and clear, calm water. Near the beach, you can also find plenty of cafés, restaurants, bars and shops. In these restaurants, you can enjoy best Canarian cuisine. If you enjoy water sports, you can practice fishing, diving, water skiing and boating on the bay. It is a beach with moderate waves and currents. However, you should be cautious when there's a swell. The beach has a guard service and a Red Cross spot for first aids. It also features public toilets, cleaning services and payphones, sunbeds and parasols. It is surrounded by gardens and offers a wide parking space. Along the beach, you can take a walk on a beautiful avenue. Unfortunately, the beach does not have an easy access for handicapped people. Playa Taurito is a tourist destination but not as crowded as Playa del Inglés or Maspalomas. It is an area away from the tourist bustle. There are 4-star hotels with excellent cuisine and service. Playa Taurito can be defined as an oasis of peace and tranquility. It's one of those beaches, where you can completely isolate yourself and relax to let go out of the daily routine and stress. It offers all basic services to spend a great day under the bright sun and at the calm waters. Find information about selected Hotels, apartments and rooms in Taurito to choose the perfect place for your accommodation.